The eyes are the window to the soul, so the popular saying goes. Human beings place a great deal of importance on our eyes. They are, arguably, the most important feature of our faces. Many people will list someone’s eyes as a key feature that makes other people attractive or not. Given the importance that people place on the eyes, it is not that surprising that people fuss over the eyes of babies when they are born. We look at a baby’s eyes and say how adorable they are. We look at a baby’s eyes when we try to decide (as people will do) if the baby resembles their father or mother more closely. During all that fussing over a baby’s eyes, one fact (or is it a myth?) has become often repeated. In fact, it has become a popular fact to cite when looking at babies. That is the idea that all babies are born with blue eyes and that, for most babies, the color of their eyes changes after their birth. Many people believe it. People will tell anecdotes about how their baby or someone else’s baby was born with blue eyes that darkened to green, hazel or brown. Is it the truth though? 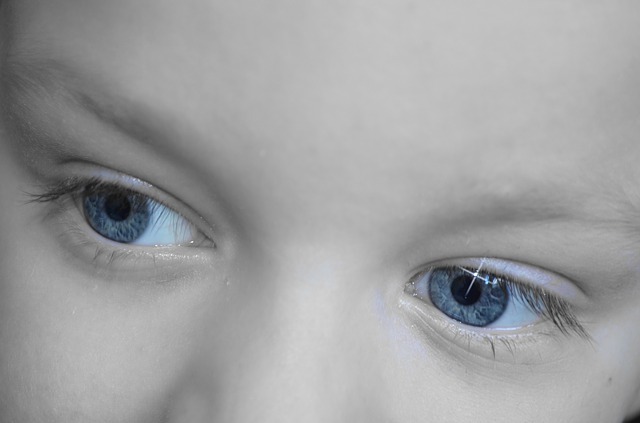 Are babies born with blue eyes that darken over time? If so, why does that happen? We will explore those questions in this article. Let’s start with what actually causes the color of our eyes. We all have irises in our eyes. The iris is part of the eye that has color. The color of someone’s irises can vary among shades of blue, gray, hazel (a green/brown shade) green, and brown. What causes the color of irises? It comes down to two things, genetics and melanin. The color of your eyes is the result of the amount of melanin (or pigment) in your irises. Interestingly enough, the only pigment we humans have in our eyes is brown. It is actually the amount of the pigment or melanin that determines our eye color. However, the amount of melanin we have is determined by our genes. Knowing that our genes control the amount of melanin in our irises and that controls our eye color it might seem simple to guess what color a baby’s eyes are. Do both parents have brown eyes? Then obviously the baby will have brown eyes? Does one parent have blue eyes and the other parent have green eyes? It might seem obvious that the baby will have eyes that are a shade of blue-green. However, it isn’t that simple. For one thing, the color of our eyes is controlled by a complex set of genes. Those genes come primarily from our parents but the genes we get from our grandparents also play a role. That is why it is possible for two parents who both have blue eyes to have a baby who ends up with hazel eyes. The simple truth is that it is not possible to predict ahead of time what color a baby’s eyes will end up being. So, now that we know where eye color comes from but we still haven’t answered the question of whether babies are always born with blue eyes? Generally speaking, people of African, Asian, Indian, and Hispanic descent have higher melanin levels. That higher melanin levels result in being born with (and retaining) brown eyes. So, no – not all babies are born with blue eyes. The story becomes more interesting when it comes to Caucasian babies. Caucasians have less melanin in their skin and their eyes. That means that, depending on the melanin level in their irises, their eyes might be blue, gray, green, hazel, or brown. People with blue or gray eyes have the least melanin. People with green or hazel eyes have a more melanin. People with brown eyes have the most melanin. Caucasian babies are frequently born with blue or gray eyes. The level of melanin adjusts during infancy and the babies change from blue or gray to darker shades of green, hazel or brown. So, some babies with Caucasian genes are born with blue eyes that change color. In fact, because of this shift in melanin levels, eye color isn’t set until a baby reaches two years old. Also, because of the complexities of the genes involved and the fact that many people have genes from both Caucasian and non-Caucasian parents and grandparents, it is possible for an infant with darker skin to have lighter colored eyes.